This colorful, striking Layered Jello Rainbow Salad is a holiday tradition in many households. Swap out the rainbow colors and use only red, green and white for a Christmas salad that’s sure to impress! 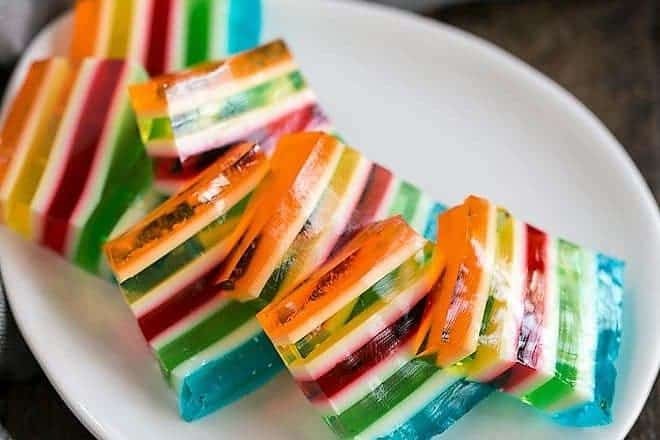 Only requiring gelatin in a variety of flavors, plain gelatin, sweetened condensed milk and water, this vibrant Jello salad recipe isn’t difficult to make, just time consuming. I used to love when my mom made a box of 1, 2, 3 Jello when I was a girl, so I recreated that recipe a few years back. Instead of 3 layers, this Jello rainbow salad, often called a ribbon salad, has an impressive nine!!! 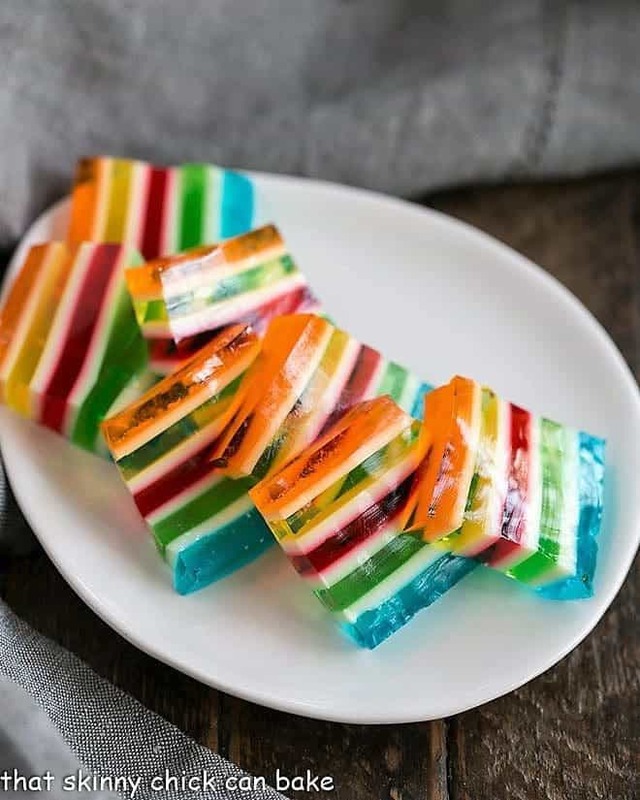 Easy, though time consuming, this layered rainbow jello can easily be made a day or two ahead of serving, and will create quite a presence on the dinner table! 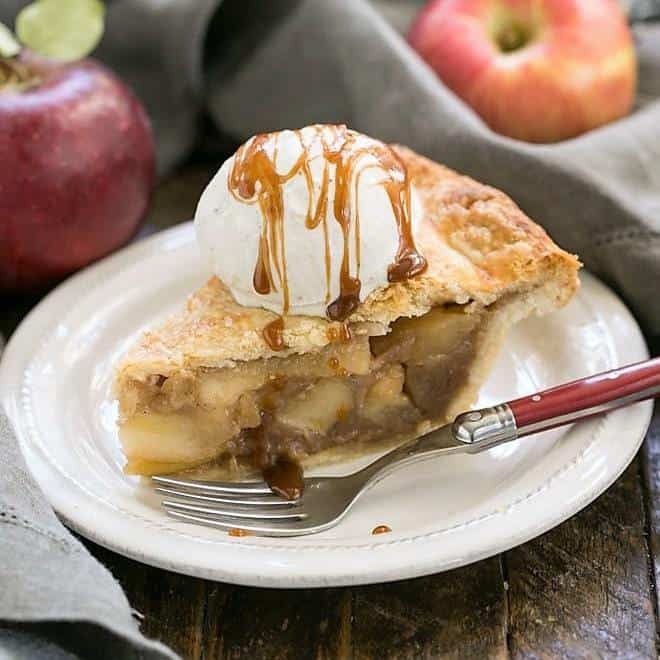 Just set aside an afternoon when you’re home reading a book or binge watching your favorite series to make this fun treat. From What Exactly is Jello Made? My dear mother-in-law, a former RN, used to tout the virtues of gelatin as a decent source of protein, especially for growing children. She went to nursing school in the 1950’s so maybe more horse hooves were used to make gelatin back then? I had my doubts, so I thought I better check it out! Jello contains four main ingredients: gelatin, water, sweetener and food coloring. So where does the gelatin come from? It’s actually a processed form of collagen, the fibrous protein that provides structure to certain body parts. Us more mature women know that we are losing collagen in our faces as we age. Sigh. But I digress. According to one source, most gelatin now comes from pigskin. 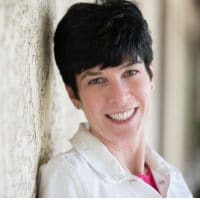 So maybe my MIL was right? The heating and cooling of the collagen strands as we make Jello allows the gelatin structure to break apart, then reassemble into their triple helix formation once again. Food chemistry 101. So yes, Jello is a source of amino acids, the building blocks of protein, but it does not contain a complete protein. I learned something today. Jello is not vegan. Jello contains an incomplete source of protein. There.you.go. I had a free afternoon over the Thanksgiving weekend, so I pulled out 5 small boxes of Jello, a box of unflavored gelatin and a can of sweetened condensed milk to make this Jello rainbow salad. A Pyrex 9 x 13-inch pan and liquid measuring cups completed my supplies. I chose a rainbow of colored Jello flavors, but using only red and green would be perfect for Christmas. Or school colors for game day. The options are endless. Look for unflavored gelatin, like Knox brand, on the shelves near the Jello. It is added to the sweetened condensed milk to make it gel. Measuring accurately is important so you don’t run out of the white mixture. PRO-Tip: Use liquid measuring cups, not dry measuring cups for the best results. Read through the directions once or twice before starting. 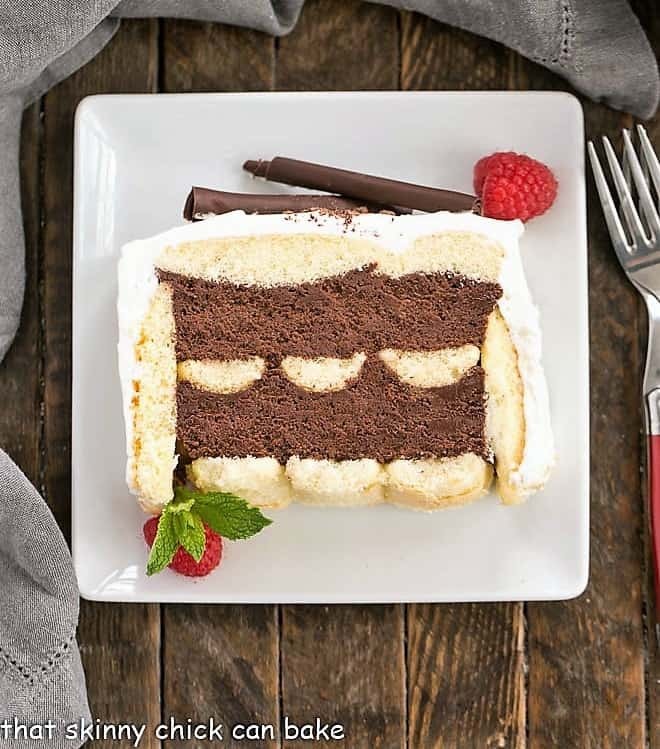 Since this recipe has numerous steps and each layer needs to chill, you don’t want to mess up! 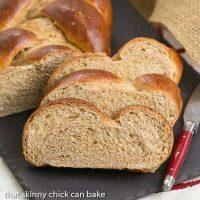 If the sweetened condensed milk mixture happens to gel while you’re waiting on the previous layer to set, just set it in a bowl of warm water and it will liquefy. 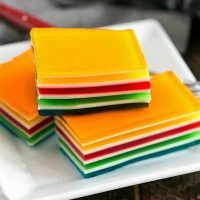 When layering, make sure to give each batch of jello some time to cool as if it’s too hot it will melt the top layer as you pour. But remember that if it gets too cold, it will gel. I like having a teapot full of hot water so I can just reheat it and pour the necessary amounts for each step. 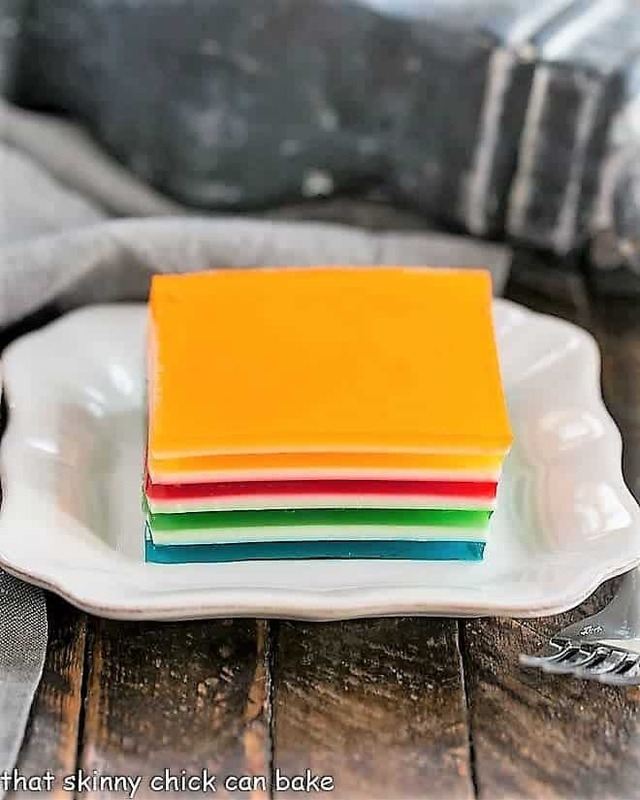 I’ve seen other recipes for this layered rainbow salad using sour cream sweetened with sugar or even sweetened and colored with some dry jello, but I liked the ease of using sweetened condensed milk. 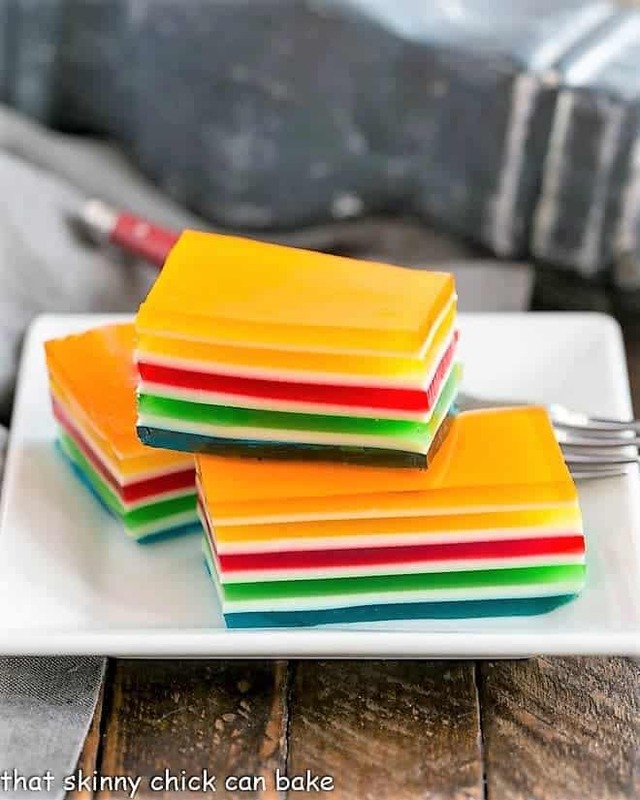 Have you heard of or made this layered jello before? 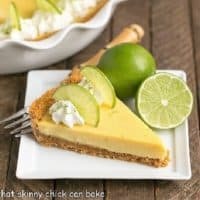 What colors/flavors did you use? What is it called at your house? Jello rainbow salad or Jello ribbon salad? If you like a gelled dessert, this Strawberry Panna Cotta is as delicious as beautiful, and I’m dying to try this Dr. Pepper Jello Salad next! A vibrant layered Jello salad that will impress both young and old! Mix 1st flavor of Jello with 1 teaspoon unflavored gelatin and 1 cup of boiling water. Let cool (not as important with the first layer), and pour into a 9 x 13-inch pan. I like using a Pyrex pan so I can see the layers. Refrigerate for 30 minutes while making the next layer. Mix 1 envelope of unflavored gelatin with 1/2 cup of boiling water and mix until dissolved. Add half a can of sweetened condensed milk* and another 1/2 cup boiling water. Mix until combined. When the first layer has chilled, pour 3/4 cup of the sweetened condensed mixture over the top. Chill for 3o minutes while you make the next colored layer. When layer two has chilled, pour layer 3, the second colored layer over the top. Chill for 30 minutes. When layer 3 is chilled, pour the rest of the sweetened condensed mixture over the top and chill for 30 minutes while making the next layer. If the sweetened condensed mixture has started to gel, just place the measuring cup in a bowl of warm water and mix until it liquefies. Use as directed. Since the sweetened condensed mixture has been used, you’ll need to make another batch from the rest of the can. Mix 1/2 cup boiling water with 1 envelope of unflavored gelatin, then mix in the rest of the sweetened condensed milk, then another 1/2 cup boiling water. Continue until you’ve used up all 5 boxes of Jello and all the sweetened condensed mixture in the same manner as before. After the last layer is poured, refrigerate overnight, covered with plastic wrap. Cut into squares or fun shaped to serve. Wow ! Never made anything like this one ! Keeper for Christmas ! Beautiful and quick ! I’m in ! 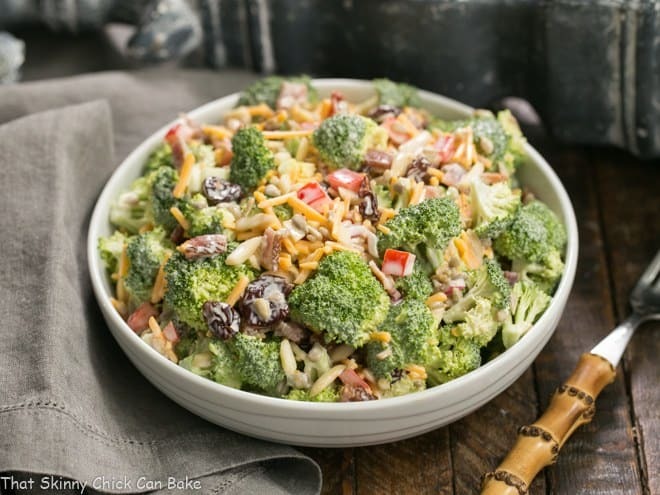 Oh my goodness Liz – this is one incredibly beautiful salad! You did an amazing job on this rainbow creation. How could resist something so beautiful! 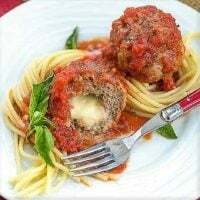 I’ve ALWAYS wanted to make this, gorgeous! This is stunning! Who would have though you could make something SO pretty with jello?? I love it! They are perfectly layered and gorgeous! I’d say this sure looks worth the effort! Beautiful dessert! I’m curious about what makes this a salad? Back in the 70’s, there was a trend to make jello salads but they generally contained lettuce and tomatoes and tomato juice; as kids we loved it although my parents hated the overly sweet concoction. Your version is quite pretty. I love the idea of doing school colours. This is something that I’ve always wanted to try. It is so fun and pretty, sure to impress. 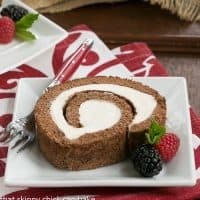 I thought this would be a fun dessert for the grandchildren on Christmas Eve dinner! I love the colors of this jello rainbow salad. My grandchildren would love it. The jello facts were interesting. What a crazy treat!!! I love it! This would be really fun to make with my great-niece. She is starting to help her mother out in the kitchen more and more and loves doing crazy stuff. She’s love this! Thanks Liz! Truly eye-catching dish, Liz. Love your follow-up to gelatin and what it’s made of too. May this holiday season be merry and bright to you & yours! My mother used to make 123 Jello too! And though I never really loved jello I did love that. Maybe because it meant we really had dessert or maybe because it was so magical…As is this. Never knew jello could be so gorgeous! Gorgeous layers, I love the colors!